Conservative leader David Cameron has said his party has done all it can to encourage the Ulster Unionists to back a deal on policing and justice powers. The NI Assembly is voting on devolving the powers on Tuesday and ex-US President George W Bush has asked Mr Cameron to help secure UUP support. The Conservatives have an electoral pact with the UUP, prompting the call. 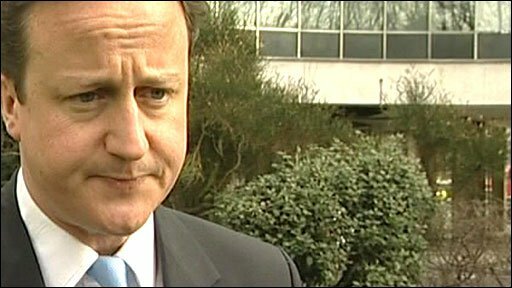 But Mr Cameron said: "The one thing we cannot do is force people to vote a particular way." He added: "We played a thoroughly constructive role, very, very supportive of what the government wants to do and what we all want to do, which is to see devolution work properly." Detail of Mr Bush's plea to Mr Cameron were revealed by the Guardian newspaper. The Assembly has begun its final debate on the transfer of powers before the vote, expected on Tuesday afternoon. On Monday, the UUP said it would vote "no". That decision was criticised by the deputy first minister Martin McGuinness in the debate on Tuesday. He said he believed the party were opposed for "cynical, party political reasons". He added: "Here is a party that complains about not being involved in decision making and yet refuses to make any contribution and boycotted the final session at Hillsborough." The Ulster Unionists' decision will not scupper the deal as the DUP and Sinn Fein have enough votes to ensure that it is passed. However, the DUP would like UUP support to show that the deal has wide backing among the unionist community. Mr Bush and US Secretary of State Hillary Clinton have both applied pressure to the UUP. Mrs Clinton spoke to UUP leader Sir Reg Empey on Friday. However, the former Ulster Unionist MP, Lord Maginnis, has said his party would not give in to what he called "blackmail" or "bribery". "What on earth do they know about about day-to-day security, policing and justice in Northern Ireland?" he said. The vote at Stormont is the first major hurdle for the Hillsborough Castle deal, which was struck last month in an historic agreement between the Democratic Unionist Party (DUP) and Sinn Fein. If the vote is passed, it will lead to powers being devolved by 12 April. The UUP have faced intense pressure from across the political spectrum to change their position. On Monday, the party accused Northern Ireland Secretary Shaun Woodward of political and emotional blackmail. UUP deputy leader Danny Kennedy said Mr Woodward had "disgracefully" linked the vote to the anniversary of the murder of Constable Stephen Carroll. George Bush, unlike Bill Clinton, is not someone who has made political interventions since leaving office; the fact he has done so shows the level of concern the British and Irish governments have about the policing and justice deal. You have to wonder if some of the pressure employed on the Ulster Unionists has been counter-productive. There has maybe been a bit of an over-reaction. The only realistic fear was that if the UUP vote no then the DUP might "cave in" for fear that being the only unionist party to have supported the deal might be exploited by their rivals at the next election. However, a survey showing most of the public want the powers devolved and voting intention data which appears to show them well ahead of the UUP and Traditional Unionist Voice may well bolster the DUP's position. It's hard to imagine the DUP's assembly group going against the deal after the party executive recommended a yes vote on Monday night. The vote takes place exactly a year after the police officer was murdered by the Continuity IRA in Craigavon. On Tuesday the policeman's widow, Kate, called a BBC Radio Ulster phone-in to ask all politicians in Northern Ireland to "get on with their job." The former DUP leader, Ian Paisley, said the UUP were making "a colossal mistake" by not voting for the devolution of policing and justice powers. However, in February, Northern Ireland's two main parties made the agreement which, if the powers are devolved as expected, will see a justice minister elected. The Hillsborough Agreement allows for the first and deputy first ministers to identify a candidate who would command cross-community support in the assembly. Alliance leader David Ford is favourite to take the post. The two smaller parties in Northern Ireland's mandatory coalition - the UUP and the SDLP - have insisted Alliance has no right to the post under the d'Hondt system for selecting ministers, which was agreed in the 1998 Good Friday Agreement. The UUP also said they could not back the Hillsborough deal on policing and justice because it failed to address matters such as education, parading and "the dysfunctional nature of the current executive". Some commentators have also speculated that the UUP are unwilling to give political cover to the DUP as they recall how that party did them no favours when they were striking deals with Sinn Fein. Update, 15 March: Line inserted to attribute details of Bush telephone call to the Guardian. Policing and justice - what will happen? Does this deal secure the future? 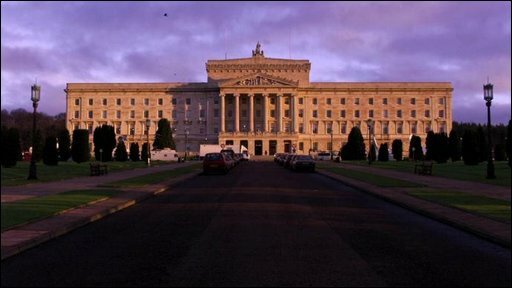 Is the NI devolution deal truly historic?